Punjab Governor Muhammad Rafique Rajwana Wednesday stressed upon the youth to work hard and utilise their energies and skills for bright future, progress and prosperity of the country. 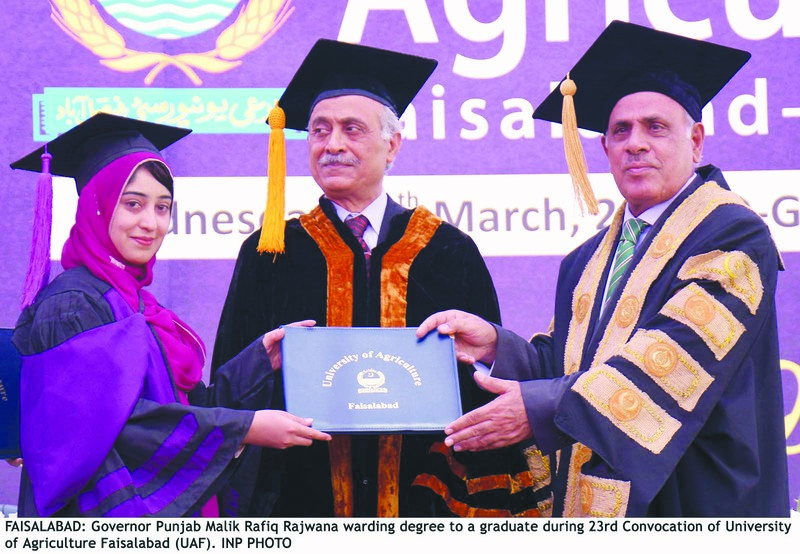 He was addressing the 23rd convocation of the University of Agriculture Faisalabad (UAF) held here. UAF Vice Chancellor Prof Dr Iqrar Ahmed Khan, MPA Najma Afzal, Controller of Examinations, Deans, Directors, Professors, faculty members, parents, relatives and large number of students were also present on the occasion. The governor said that the country had been put on the right track of development by strengthening of the economy and improvement in the law and order situation under the leadership of Prime Minister Muhammad Nawaz Sharif and Punjab Chief Minister Muhammad Shehbaz Sharif.